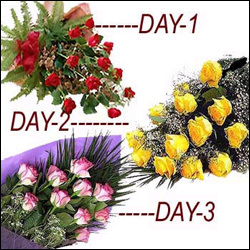 Your wishes goes at door step for three days. 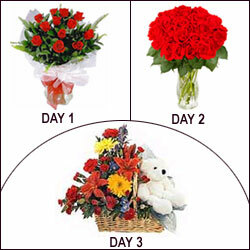 Hamper includes: - First bunch - 12 red roses bunch 1st Day. Second bunch - 12 yellow roses bunch on Second Day. Third bunch - 12 pink roses bunch on Third Day. 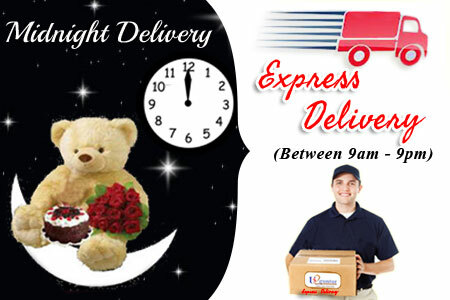 Note: Delivered at Hyderabad, Secunderabad, Guntur, Vijayawada, Bangalore, Kakinada,Warangal, Vizag. and for other places this hamper will be delivered with a minimum gap of 30mins and is subject to the acceptance of us2AP based on distance. 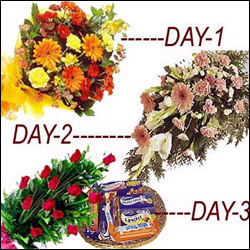 Wish her all the day from morning to night with this hamper. 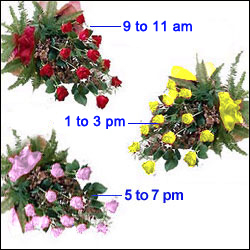 Hamper includes -Three 12 roses bunch first bunch between 9.00 to 11.00 AM Second bunch between 1.00 to 3.00 PM Third bunch between 5.00 to 7.00 PM again. Let receiver feel your love & care throughout the day. Pink Flowers are everyone's delight. 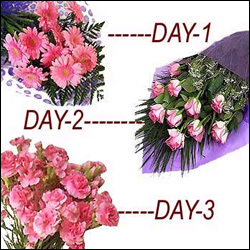 Surprise her for three days with this cute Pink color flowers. 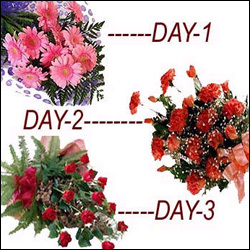 Hamper includes: Day 1- 10 Pink Gerberas Day 2- 10 pink roses bunch Day 3- 10 pink carnation bunch. 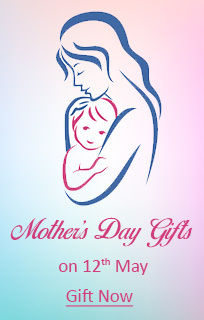 Gift them your love & care with something favourite of their choice. 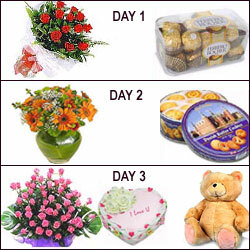 Overflowing with your love and affection, this hamper is sure to pleasure for three days. 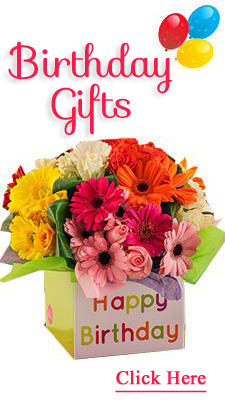 Beautiful hamper includes Day 1- Seasonal mixed flowers bunch includes roses, gerbera, gladioulus, carnation with lots of green fillers. Day 2- 12 Stems of Gerbera & carnation bunch with matching ribbon & bow & lots of green fillers. 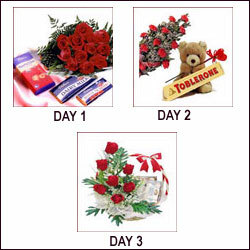 Day 3- 12 red roses bunch with chocolates worth Rs. 100( Chocolates are well packed with red colour paper to match with roses bunch). Note: tray not included with this. Say that you love and let them feel it. 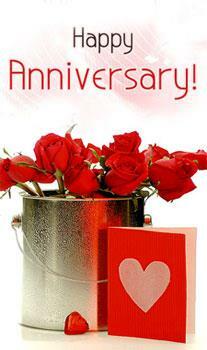 Send your wishes, love& care. 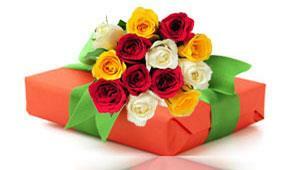 Hamper includes - Day 1- 12 Red dutch roses bunch with Ferrero Rocher 16 pieces ( An ultimate chocolate lovers delight ). Day 2- Gerberas in a Vase with Danish butter cookies 454 gms. Day 3- 36 Pink Roses Basket with 1.5 kg heart shape special cake and teddy bear. 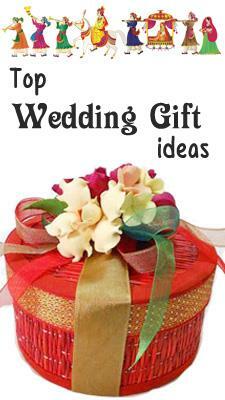 Perfect combo gifts to wish your loved ones. Longing to see all day smiles...then this is the perfect gift hamper. 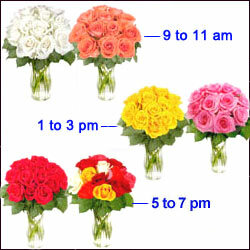 Hamper includes totally 6 Bunches (each bunch with 12 Fresh Roses different/ same/ mixed colours along with glass vases )will be delivered.